Do you know that song? I start singing it in November. It reminds me to stay calm and enjoy the holidays since December is always a busy month in my house. Along with Christmas and holiday parties, we have a birthday, so the festivities just keep on coming! To manage the hectic holiday season and stay holly jolly, along with singing, I plan to keep everyday meals simple, nutritious and delicious. Turkey is always part of that plan; it provides lean protein for long-lasting energy and nutrients to help keep you healthy during the holiday season like immune-system strengthening iron, zinc and selenium. I choose basic, nutrient-rich ingredients like lean turkey, veggies and whole grains for weeknight meals normally, but especially in this goodie-filled month. I’m pretty sure that I’m not alone in my desire to manage holiday stress and stay healthy.. So, I thought I’d share three suppertime strategies that I put into place during this busy season. Make-ahead meals are the best, aren’t they? I spend a bit of time big batch cooking early in December. I make turkey stews, soups and casseroles that I can put in the freezer, and pull out when I need a quick meal during the month. It’s super handy to have a meal ready to feed any hungry unexpected guests. Honey Lemon Turkey Tenders. These quick and tasty turkey tenders can be frozen in the marinade. Take them out of the freezer in the morning, put them in the fridge to defrost, and they’ll be ready to cook when you get home. Add a salad and rustic whole grain bread and dinner is served. Tasty Tip: Double (or triple) the recipe and bag in meal portions so you’ve got turkey tenders ready in the freezer for the month. 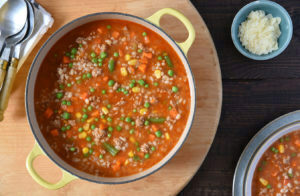 Quick and Hearty Barley Soup. This soup is a meal-in-one and perfect for making ahead. It makes enough that you can enjoy it for dinner and freeze some for a quick meal another night. I know a lot of us plan for extra turkey at holiday meals so we can turn leftovers into yummy turkey sandwiches, soups, quesadillas and pizzas. But I’m here to tell you: don’t wait until December 26th to cook a turkey and benefit from all the leftover goodness! You can cook turkey any day of the week and have leftovers any time of the year. Cook a whole turkey, half turkey or turkey cuts for dinner and then enjoy leftovers for another meal (or two!) during the week. 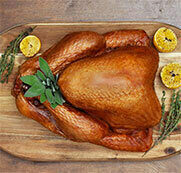 Shopping tip: Looking for a specific turkey cut? Ask at the butcher or grocery store about available cuts. Turkey Ramen. 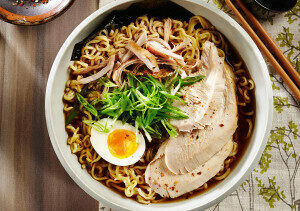 I guarantee that this flavourful ramen will quickly become a family favourite! I top it with veggies to make it a meal. Try slivered mushrooms, spinach and shredded carrot. If you make the broth in advance, you can have a warm, scrumptious bowl of soup on the table in 30 minutes. Turkey Frittata. I’m a big fan of breakfast for dinner and this frittata gets top marks in the nutrition (and taste) department. It’s jam-packed with basic, whole food ingredients including turkey, eggs and lots of veggies. And, it cooks in just 20 minutes! One-Pot Turkey Veggie Pasta. Easy peasy! 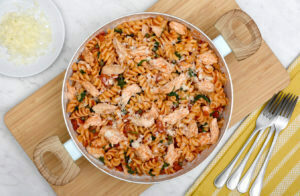 This tasty one-pot turkey veggie pasta dinner is super simple to make in about 15 minutes. It’s a big hit with my pasta-loving teenagers. There are four different turkey n’ veggie combos included so you could make a new version every week in December. Sheet Pan Lemon Honey Garlic Turkey Dinner. This sheet pan supper includes root veggies and turkey marinated in a delectable sweet and spicy glaze. This will definitely become a regular in your menu rotation! 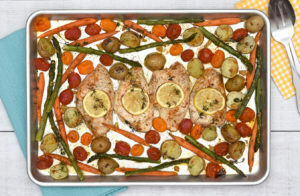 Sheet Pan Turkey Dinner with Veggies and Herbs: The turkey and herb combo here is spot on! Switch up the veggies however you like. Instead of asparagus, go for green beans. No carrots? Add sweet potatoes. Just choose (or chop) veggies that will cook in about the same amount of time as your turkey. This holiday season, plan to use turkey as a go-to, nutritious and delicious time saver so you can spend less time in the kitchen and more time tobogganing, skating or playing board games with family and friends.